Fonte Santa, two bedroom townhouse for LONG TERM LET with swimming pool near Monte Rei Golf & Country Club. 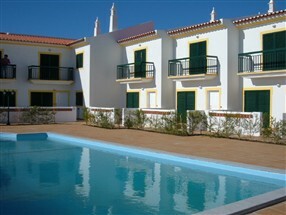 Two bedroom Townhouse for long term let with swimming pool nearby sea and golf resorts. South facing two bedroom townhouse located in a small village called Fonte Santa, near by Vila Nova de Cacela surrounded by farmland and orange groves. This exclusive development of only 11 townhouses is centrally located with three golf courses and various beautiful beaches only minutes away. 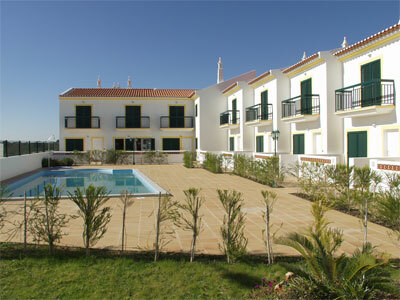 There is a large communal swimming pool with outside showers and landscaped gardens. The development is fully fenced and secure for children. Guests may use the swimming pool facilities free of charge. It's an ideal place to stay and to use as a base to explore the Algarve, it's many beautiful beaches, water sports and the golf courses near by. The Quinta da Ria and Quinta de Cima golf courses are the nearest by with Benamor golf a good second best. Moreover, the Monte Rei Golf and Country Club is about 4 kilometers / 3 miles away. This 18 hole Golf course was designed by Jack Nicklaus Signature and a second one is in the offing. The Monte Rei Golf & Country Club is without doubt the most exclusive and cosmopolitan development of its kind in the Eastern Algarve. Surrounded by over 400 hectares of the most beautiful Algarvian countryside, when complete it will feature two spectacular and challenging world-class 18-hole golf courses as well as a Clubhouse with restaurant for fine dining, an extensive spa complex, shopping area, tennis complex and an equestrian centre for those individuals who would like to explore the idyllic countryside of the Eastern Algarve on a horseback. There are some lovely restaurants within 15 minutes of the property in Manta Rota, Cacela and many more in nearby towns Tavira and Monte Gordo. Monte Gordo also has a casino and many bars for late night entertainment within a 15 minutes drive. The townhouse is modern and stylish designed throughout and has a Mediterranean ambiance. The house consists of a living room with dining area with table and 6 chairs, a fully equipped kitchen (electric oven, gas hob, microwave, dishwasher, fridge/freezer, toaster, kettle, coffee machine etc.) with natural stone worktop, a cloak room with washing machine. Natural stone staircase leading to the first floor consisting of two double bedrooms (one with twin beds and Z-bed) both with built in wardrobe (one with south facing balcony) and two bathrooms (one en-suite). The living room and both bedrooms have air conditioning (cooling, heating and dehumidifier). Private terrace in front of living room overlooking the (at night time, illuminated) communal swimming pool and surrounding terraces. Sun loungers and teak wood table with parasol and chairs. Car recommended. Allocated off street parking for one car only, additional parking space available opposite entrance. Price is per month, excluding utilities. Minimum stay two months. Included bed linen, towels (excluding pool & beach towels). Sorry, No Pets and No Smoking in the House.